Chinese Mid-Autumn Festival (中秋节) is approaching. Lunar calendar 15th August, which is English calendar, 3rd Oct 09. Mooncakes from all brands, hotels and bakeries, are selling hot and fast in the market. I personally think moon cake is overly priced, just for the season, but no choice. Mooncake is the main festive food we have to have for this festive celebration, for self consumption as well as for gift to family and friends. I am not a big fan of mooncake, but of course, I MUST have mooncake every year since it can only be eaten once a year (smile). However, I thought unless you are going for really famous one or unique flavour which can’t find anywhere, make your own mooncakes! From basic lotus paste or red bean flavour to green tea flavour, you can make it your own at home! Snow skin is very easy to make. Called it snow skin, I guess it’s because this non-baked mooncake has smooth and light layer of skin resembling snow. And it is also to serve chilled. It’s fast and easy to make.. but many details have to be noticed (See my below listed tips). To warm the heart of your loved ones this year, make your very own mooncake to impress them! 1) Boil water with pandan leaves for 10 minutes. Heat off and leave to cool. Add in pandan paste and stir till disolved. Leave in refrigerator to chill before use. 2) Add toasted melon seeds with lotus paste and form into each small ball (about 60 – 70 gram each lotus paste ball). 3) Place fried glutinous rice flour, icing sugar, snow powder and shortening far into a large mixing bowl. Mix well with spatula, or electrical mixer at low speed, till mixture turns into crumb-like texture. 4) Add cold pandan water into crumb-like flour mixture. Mix well with spatula, or mixer at low speed (about 1 – 2 min), to form soft dough. Remove soft dough from mixing bowl and place it on a floured (with fried glutinous rice flour) table top and knead for few seconds to form into a dough ball. Rest dough for 10 minutes. 5) Cut dough ball into halves and roll it out. Cut the rolls into required size (about 10g each) and flatten each small dough into thin layer. 6) Fill in lotus paste, seal and shape the cake into ball. Lightly pat just a little fried glutinous rice flour all over the cake ball. 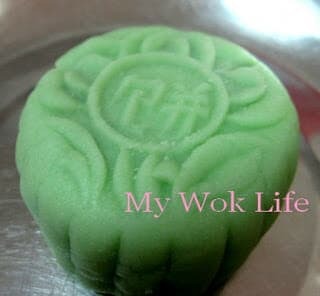 Also flour the mooncake mould before placing cake ball into the mould and press firmly. 7) Over turn the mould to knock the cake out from mould. Repeat steps till all ingredients used. Ready to serve chilled. 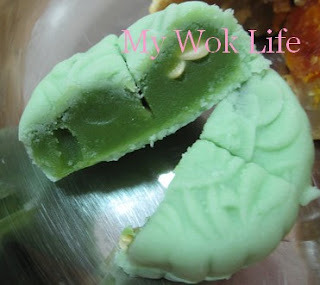 Soft, chewy and fragrant snow skin mooncake. I liked it not too sweet. It can be served at room temperature or chilled. 1 mini snowskin mooncake counts about 200kcal. Snow skin moon cake can be stored in refrigerator, and it may last up to 2 weeks. However, snow skin might be harden if store for too long. To reduce/ prevent harden skin, place mooncake in a box and wrap the box with newspaper. For traditional baked mooncake, check it out now.. Tips: Mix with snow powder is to reduce sweetness of the mooncake skin. If do not wish to add snow powder, use 200 grams of icing sugar instead. Same thing, if wish to reduce sweetness further, use 200 gram of snow powder and completely omit icing sugar. * Shortening fat is vegetable fat with less grease. 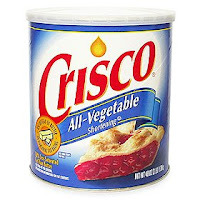 Other brands besides Crisco, can be found in major supermarket stores and baking supplies shops. * Flour used for skin making as well as coating and flouring table, all must be the fried glutinous rice flouw and not the normal glutinous or plain flour. Only the fried one is edible without baked/ cooked. Even though it is called fried rice flour, but it is still look pretty much ike normal rice flour in white colour (NOT brown colour nor fried crisped texture). Ready fried glutinous flour can be found at major supermarkets. * Rest the soft dough to turn it into moist and pliable textured snow skin. If rest soft dough longer than 10 minutes, cover dough with dry cloth or cling wrap when resting it. * Snow skin can make into different flavour and colour by changing the flavour/ essence, according to different filling used. * If you wish to add salted egg yolk, reduce amount of lotus paste to half. Salted egg yolk and lotus paste can be found at major supermarkets. Hmm.. Jocelyn, so sorry to tell you that I do not quite understand what you mean by distinctive taste similar to other HK pastries..
To me, snowskin is meant to taste light, soft and great mouthfeel especially if serve chilled. I personall do not feel any after taste of the snowskin. hi patrica. don’t worry abt it. cos i really don’t know how to describe it either. it’s just that i really love snowskin moocakes. but some bakeries’ snowskin mooncakes seem to have this really sweet and weird after taste that i don’t like. and it came from the snowskin, not the filling. Now that you mentioned abt the sweet taste of you quite fear of, I guess it should not be the problem from snow powder as this snow powder is meant to reduce the sweetness of the snowskin, if you do not like too sweet taste of the skin. Instead, if you added just the icing sugar, the snowskin will be very sweet. So, do not reduce the amount of sugar, but I will recommend you to add more snow powder than icing sugar amount to make up the total of 200 grams. thanks! i shall try to find snow powder then, cos i’m in NYC now and i’m not sure i can find them. in fact, i’m not sure if i can even find lotus paste! lol. Snow powder is just look alike with icing sugar, the differences are snow powder not too sweet and not easily melted. haha~ i have come to the conclusion that i needed to make my own paste and that’s what i did! lol. but it’s not as smooth as i want it to be, cos i didn’t have a blender to make the paste smooth. it’s alright. take it as a diff texture, i guess. i really want traditional lotus paste, so that’s why i’m insisting on it. lol. I don’t think I ever see fried glutinuos rice flour in the asian market I shop. How can I make it out of the glutinuos rice flour? what is snow powder? What is icing sugar? Is confectioner’s or powdered sugar same as icing sugar? Fried glutinous flour is cooked type which we may eat instantly without baking or cooking it. In Chinese, we called it Gao Fen 糕粉. This fried glutinous rice or called it cooked sticky rice flour should be available in Asian Market, perhaps at provision shops in Chinatown.. Snow powder sugar is the doughnut sugar or used on pastries, a non-melting sugar. This is similar to powdered sugar, only it doesn’t melt as easily. And yes, icing sugar is powdered sugar or called it Confectioners sugar. 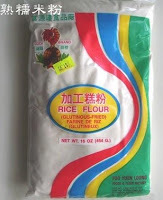 I can’t find fried glutinous rice flour in Asian market here in California, USA. How can I make it myself? I thought this common flour type is easily obtainable in California, especially San Francisco. And sorry to know that it is not so… I did not personally try to make my own fried glutinous rice flour, but try this method to get cooked glutinous flour. Hope it helps to solve your problem in this matter. Continuously stir-fry the glutinous flour in a wok at mild flame for an hour or more might take up too much of your time to get the job done. Try this, steam 200 gram of regular glutinous flour for about 20 minutes. Then, bake at 300C or microwave at high heat for 2 – 3 minutes, in incremental of 1 minute at a time. Stir to mix the flour up after each minute of heating. You have to watch out the heating time to prevent the flour from burnt. Do let me know if it is doable! Thanks for the procedure on how to make fried glutinuos rice flour. Won’t steaming wet the flour? Hmm… you may tie a sheet of dry cloth on the wok lid to absorb the steam from condensation on the lid and dripping down to your flour. Try it out with a little for the first time to get the method right, I guess.. Or, just bake and microwave it, or slowly fry it in the wok with low flame? So sorry, I did not personally try to cook this flour before.. Let me try, and I will share with you my outcome in due? We’ll wait for you to try to cook the fried rice flour and share the outcome with us. Please also share with us how to make Mochi. Thanks! This is so late but can I just say how much I heart your recipes? hey!!! i did the snow skin, but it was so sticky… then only i realise i bought the glutinuos rice flour with no FRIED words on the packaging….does this difference the outcome? You have to use fried glutinous flour as I do not think non fried one can be consumed directly. Hi Patrica, I tried your recipe. Smell nice and taste good. But I got 1 question. When I doing the skin dough, it’s form a soft dough. But it will have small bits of dough dropping off? No. The texture should be soft and smooth. You need to also moist your palm with some oil before kneading. Anyone out there know how to keep the snow skin longer? My can last 2 days only! On the 3rd day it started to harden. Hi, anyone out there know how to keep the snow skin longer? Mine lasted for 2 days only! On the 3rd day it started to harden. Hi, may I know where to get loutus paste in Singapore? :) And what kind of food colouring will you recommend? Ready Lotus paste is available at Phoon Huat baking suppliers. Google Phoon Huat for outlets’ address. Sometimes, NTUC Extra, Giant Hypermart or Carrerfour sell it, too. hi, may i know where you get snow powder in Singapore? Snow sugar powder is easily available in many supermarkets. Look around the baking cells and you shd be able to find it. It usually comes in packet. May I know why my mini mooncakes hardened after a night in fridge? Hi Michelle, try to store your mooncakes in an airtight container as I think the temperature of your fridge is very low. My shortening is not in room temperature when I mix to a crumble! Any problem with that? I think it shd be fine, but I was worried that it doesn’t yield soft enough snow skin if that’s the case. If I m bringing the snow skin mooncakes to places like church, can be in room temp? At least stay for two hours in room temp then serve! Will that be a problem? Ur snowskin mooncake is soft even is chilled? How did u do that?